Have you ever gotten a batch of 180 pills, with 100 in a manufacturer's container and the other 80 dispensed by the pharmacist? Or 90 pills, which were probably dispensed from a 100-pill container? If all these meds were packaged in 30-pill containers, the pharmacist could just look at the number per day the patient is to receive and pull the amount easily. If it's two a day, pull two containers. If it's three, pull three. Maybe the drug company would supply 30-count packages to retail pharmacies and 90-count packages to the mail-order ones. No undercounting or overcounting. No chance of mislabeling. Less waste of packaging. Simple standard counts. Is that being done anywhere? I figure it won’t be long before anyone with any lean knowledge is going to be banned from airports. Airlines must be pretty tired of our criticism by now. I'm in Dallas to the Association for Manufacturing Excellence conference. In the Detroit airport, I saw something just a tiny bit like lean. As I waited for my American Airlines flight, I observed the action at the AirTran gate. At 2:20 pm, long before the AirTran plane arrived, the gate agent was telling the scheduled passengers in the "human inventory holding area" (HIHA)that AirTran was going to have a quick turn – essentially reducing changeover time between deplaning and embarking passengers. She said it would take 20 minutes and at 2:50 precisely she was going to shut the plane door. When the plan was docking, she reminded people what the plan was and started them lining up, directing them to an area where they wouldn’t get in the way of the deplaning passengers. I wonder how they were being shooed off the plane on the other side of the changeover. I had to board my flight before the AirTran flight hit the magic 2:50 start time, but I suspect that the quick turn was more successful than the American turn was – darn – I should have timed ours, but didn’t think of it. Last week I participated in a kaizen learning experience conducted by Ron Holcomb of the Lean Learning Center. Jamie Flinchbaugh, one of LLC’s founders, has been incredibly gracious about inviting editors to public training events without charge. I don’t think he does this with the goal of free publicity for the Center – his writing appears often enough to get the company plenty of visibility. I think he does this to make the lean community better by making people like me more knowledgeable and grounded so I do a good job of editing the newsletter. This is important because I get a variety of possible articles and some authors just don’t know what they’re doing. The more I know about lean in the real world, the better I can screen out the junk, and help serious writers get their message across in the best way. Not only did the Lean Learning Center open their doors to me, but a local company opened their doors to our class of about ten people from other companies. Some of us knew nothing about lean, and some knew a lot. Our companies were diverse. Our host company had about six core people in the on-site sessions, with others drawn in from time to time. Our class had spent Monday at the LLC’s learning facility, getting the basics of kaizen, activity maps and product-process maps. Most of the people in the class were there so they could go back and facilitate kaizens at their companies, so the training covered how to draw up a team charter, assess the possible kaizen candidates and choose the best, pick the right team members, interface with sponsors productively, teach the process and follow up after the event. It was a lot to take in. Our host company had two people in the class, who were expected to go on to be facilitators in the ongoing program. On site, Ron led the group in mapping the current state of a bottleneck process. There was a good cross-functional team from the host company who provided the details of the process from start to finish. There was a lot of “I didn’t know you did that,” and “That can’t be true!” in the three days we spent on site. Most companies don’t want outsiders around when they look at ugliness, particularly in a company in the early stages of lean when there’s plenty of ugly to go around. It was a leap of faith and a sign of management commitment that we were let in. (The company had the right to review the registration list beforehand and bar the participation of anyone who they felt should not come there.) The company was extremely careful to let us know where we could and could not go, and they had good sign-in and sign-out procedures to protect the confidentiality they assured their clients of. Why did they let us in? Well, we were the “fresh eyes.” We didn’t know their process, and many of us couldn’t understand a lot of the complicated technical talk in the room. But we kept asking questions, and in explaining things to us in detail, they started understanding their own current state better and better. In fact, their process had been mapped not long before, and when the host company’s folks compared the two maps, it was obvious that outsiders had helped them get down to a more revealing level of detail. Management commitment was good. The operations manager, the kaizen’s key sponsor, was obviously enthusiastic and in the room for most of the three days. The company also had promised that the key process owners would spend all three days in the room, unless the direst problems needed their attention. For a company that was growing fast, and depending on the knowledge of a relatively small number of engineers and technical people, this was a serious sacrifice for potential improvement. Top management came in for presentations by their teams. Some were won over to the cause, and some remained skeptical, but that’s what we expected. It was a start – a foot in the door. The people taking the class appreciated the chance to learn about kaizen in a real-life situation. We took turns facilitating – trial by fire. I was treated like anyone else in the class, not like an observer. Everyone left with a gain. Better skills, a better understanding of why kaizens should be conducted in a certain way, and how kaizen fits into the overall system of lean. My point to you? Open your doors to guests. Make them work by requiring their observations and ideas. Make the lean community better, not just your own operations. Thank you Jamie, Ron, and all the people who took part in the kaizen experience. I am so grateful to you for investing in me, and in the lean community as a whole. Not every kid needs to go to college. Vocational high schools are not just for losers. Voc ed is not about kids making birdhouses. Today’s students will turn ideas into digital CAD designs, then translate the data into computer numerical control programs that transform blocks of metal into beautiful shining objects. These kids will compete in robotics contests. They will diagnose and repair automobiles run by little electronic devices with more computing power than a 25-year-old IBM mainframe. North Carolina Governor Mike Easley can tell you about the new manufacturing plants coming to his state because of the skilled technicians its educational system is producing. These aren’t low-wage jobs in the dark, dangerous and dirty factories parents imagine when they think of their kid’s future. Companies like Boeing, Medtronic and Toyota, along with their suppliers are already crying out for the talent to fill open positions. As baby boomers leave the workforce, the need for technical workers will reach crisis proportion. Community colleges are fast becoming some of the most important educational institutions around. They routinely collaborate with local employers and economic development agencies to equip students with the experience in problem-solving, teamwork and manufacturing process knowledge to keep these factories running. In York County, SC, students at a new community college campus will be making full size physical models from the same kind of CAD data the machinists started with, except these will be made of paper and goop with 3D printing machines that are nothing short of magical. The company that produces the machines is relocating its headquarters from California to South Carolina, sharing the cost of educating these young people. It desperately needs a supply of workers who can understand the process and support the equipment that’s rapidly being acquired by forward-looking companies. The beautiful contours and perfect fit of the sheet metal on today’s automobiles depend on the high-precision complex dies that withstand tons of force applied by immense stamping machines, thousands and thousands of times. Managers where the dies are designed complain that new college-educated engineers may have never operated a stamping press, or even seen one. Thus they don’t fully understanding the processes and lack the ability to make the tooling without its needing costly rework. Next time you fly in an airplane, ask yourself how important it is that the engines perform as expected. Would you like to take for granted that the semi behind you on the freeway has brakes that can stop it when needed? What about that pacemaker in your Dad’s chest? Not only do you want competent engineers designing these things, you want the people who build them to know what they’re doing. I recently met some people from the maintenance, repair and overhaul facility at Anniston Army Depot. Vehicles damaged in Iraq – some nearly demolished – are sent there. This is the most advanced military equipment in the world. It is dismantled and examined. New parts are delivered immediately or fabricated on site using laser and waterjet cutters, high-speed machining centers and stamping equipment. This is without tying up taxpayer money in big inventories of just-in-case parts. One of the Anniston guys told me he’d tried college but decided he wasn’t cut out for it. Yet he has skills and talent most of us could only wonder at. Go into a factory and you’re likely to see spotless floors, well-organized groups of machines, whiteboards continuously updated by workers. Any heavy lifting will be ergonomically assisted. You’ll likely see a conference room where work teams are analyzing how work is done and continuously thinking of ways to do it better and cheaper. You’ll see people throughout the plant proud and confident that fruits of their labor are competitive in price and quality with those made anywhere in the world. No, the job in the textile mill may have gone away, but today’s manufacturing jobs are plentiful, infinitely more interesting, and requiring skills you’d never find in a college classroom. Should every kid have the chance to go to college? Of course. But there are many more paths to success and achievement than most people preparing our students for the future can even imagine. Congratulations! You have been selected to be a 5S Coach and a Champion in our 5S+1 Makeover Blitz during the week of July 31st – August 4th. During the next week, we will be conducting 5S cleaning and organizing activities with the help and support of 5S Champions throughout the division, as well as numerous other guests and Lean experts. The project will be facilitated by Richard Kunst, Patrick Hart, and Chris White of La-Z-Boy Continuous Improvement, and Richard Evans, of the Canadian-based company Messier-Dowty. During the week you will be participating in a wide variety of training sessions and workshops, each designed to enhance your knowledge of 5S+1 and visual systems, and expose you to the various tools and products we have to assist you, and all of our employees in our planned 5S+1 transformation. You will also be asked to conduct a 5-minute 5S tutorial with employees in your area each day, and to assist in the implementation of “5S projects” in your area as time and work schedules permit. Each one of the projects is designed to reduce waste and eliminate clutter, and all of the projects will take only one man-hour per person in that area. In addition to our own La-Z-Boy Dayton employees, a team of outside eyes (and hands) will be helping transform some of our departments in need of attention into safe, clean, and effective workspaces. • Have all our 5S Champions trained in 5S and its benefits and practicing 5S on a daily basis. The purpose of the 5S Makeover Blitz is to remove unnecessary materials and items, and improve process and material flow, and overall efficiency. 5S activities also aim to reduce safety hazards and create a clean, professional working environment for all La-Z-Boy employees. The project will take place of the course of 1 week, but the 5S effort will continue always. The training sessions will last from ½ an hour to 2 hours depending on the date. The week will begin with an introduction to 5S+1, July 31st @ the Plant 06 and Plant 19 large Conference rooms. The event will be exciting and fast-paced; focusing on real time implementation of all our ideas, so come dressed appropriately (jeans, t-shirt, and comfortable shoes). Myself, I will be in attendance during the training and helping out during the event. I am very excited about that. This process offers you an opportunity and a mechanism to capture and incorporate all the creative ideas that you have to offer. Rise to the challenge, and do not forget that your commitment, support and participation are what will enable our company and our people to benefit from this effort. Once again, I congratulate you on your selection. I am looking forward to working with you and receiving your usual fine effort in getting the job done. That’s Krug’s Law, and the title Steve Krug’s irreverent book about web usability. If you have a web site, this little book (181 pages) could make a big difference. 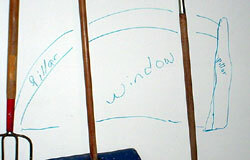 It could also help you improve standard work documents, visual controls and building signage. Steve doesn’t call it the gemba, but he knows where to find it. Right next to the user trying to get something done on your site. Conference-room debates about what the “average user” will do are about as worthwhile as what the “average worker” will do, or how the “average part” will go through a process. Web designers create waste when they don’t understand “eye paths,” what a person does when encountering a web page, brochure, or printed instructions. People don’t start at the top left corner and read down each column from left to right. They scan, zig-zagging down the page to see if there’s anything there they care about. There are visual dead spots, like the upper right-hand corner and the lower left. Steve shows how to make a visual hierarchy that telegraphs how the page’s information is structured. What happens when someone sees your web site or powerpoint presentation? You’d be surprised at how many needless words we use – OK in conversation – but waste in writing that must convey information fast. Here’s a game I like to play using the word-count function in Microsoft Word’s tools. Take a piece of writing and cut it by 20%, then go back a week later and cut 20% more. Steve’s book is visual, with a big investment in color printing and pictures of real web pages. The “before” and “after” examples are eye-opening. Steve reveals the principles of good navigation – also applicable to where to put your andon boards, or other plant visuals. A lot of people hate doing the laundry, but I like seeing the results. It was a slogan created by the wife of a Delmarva Power and Light executive during the oil crisis of the 1970s: “Use your solar dryer.” Is this an example of lean? 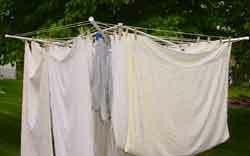 It takes more time to hang clothes on the line than to move them from the washer to the dryer. More labor too. And space, since you need a dryer for winter and rainy days. What would I be doing if I weren’t hanging out the clothes? Working? Reading or watching TV? Hanging up laundry gets me out of the house for some fresh air and mild exercise. I save an infinitesimal amount of otherwise-squandered fossil fuel. Sheets and towels get that line-dried crispness and fresh-air smell. Space? 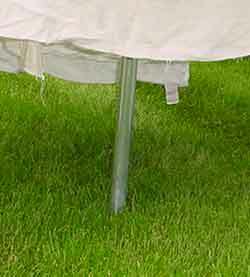 A piece of PVC pipe is planted in the dirt, and holds the base of the drying thing when it’s in use. My clotheslines are mounted on an umbrella-like folding contraption that lives in the garage. Whoever invented this humble, handy and hard-to-find device ought to get the Nobel Prize. It does away with the “missing sock” problem and time-wasting sock-sorting. 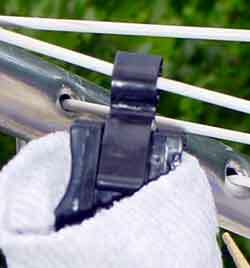 When you take off your socks, you hook them together with the sock lock. They go from hamper to washer to dryer then back to the dresser. Your fresh socks are right there, still locked together. Yes, you can be married to a man for 27 years and not know everything about him. I didn’t know that every time I put his clean underwear in his dresser, Mike took it back out and stacked it in his version of an efficient presentation. The underwear can’t be inside out, and it has to be stacked with the front side up. 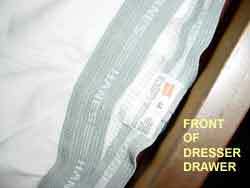 The waistband is oriented toward the wearer. So, when he rolls out of bed late, he can grab the top pair, have it perfectly oriented in front of him, and step right into it. Lean at home often amounts to trivial gains. Yet it helps keep the habit of seeing lean opportunities everywhere. A two-car garage is a bit of a squeeze if you actually try to fit two cars into it, even if they’re small. One of us has to back her car in, while the other pulls his car in front-first. Unlike my husband who, having been born and raised in Detroit, has a physical sense of where his car’s wheels, bumpers and sheet-metal are whenever he is driving or parking, I’m always too close to or too far away from things when I park. If I don’t pull far enough into the garage, I can’t close the garage door. If I pull in too far, I can’t get through the door into the house. If I’m too close to the side of the garage, I break the mirror off as I back in. Too far away and neither of us can get out of our cars. It drove my husband crazy. One day, I thought about the 5S shadow-board. I moved the car up and back until I had the perfect fore-and-aft position, and the distance away from the wall was acceptable. Then I sighted a couple of locations from the driver’s seat, took a magic marker, and drew indicators on the wall showing where I had to locate the car when pulling in. 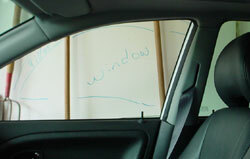 This was a big help, but didn’t address the problem of hitting the prescribed distance from the wall. 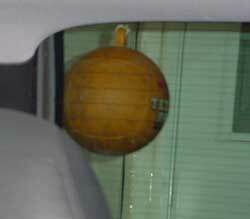 Then I remembered a drive-through car wash I used to visit that had a rubber ball suspended from the ceiling, with a sign nearby that said to put your car in gear when your windshield bumped it. 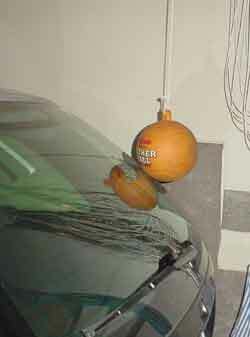 It occurred to me that if there were a similar ball suspended from the garage ceiling that I’d only touch if I was in the perfect front-and-back and side-to-side position, the whole problem might be solved. I don’t do any physical maintenance tasks at home, so I had to persuade Mike that it was an idea with merit. Eventually he agreed to perform the experiment, and now sees its wisdom. The constant worry that I might not properly park the car is off his mind. The only disadvantage I can think of is if you had a ten-year-old kid at home. It would only be a matter of time before there’d be the day when the car was out of the garage and he or she would be compelled to swing at it with some bat-like object so it would fly off and break something. Aaah, one more benefit of having already paid for college and sent the offspring off on his own. 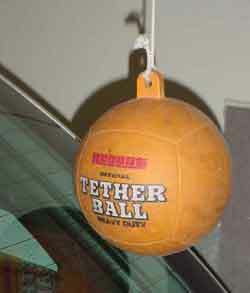 The tether ball is likely to remain unmolested. Don’t send your kid to my house, please.